The State Duma will consider a draft legislation regarding countermeasures against the aggressive policies of the US and Europe. 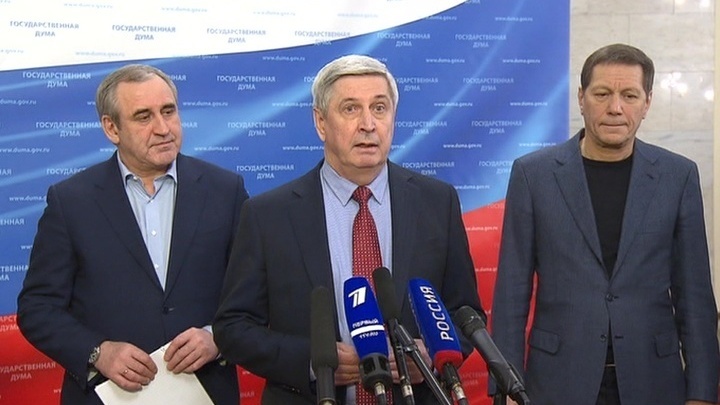 The bill was introduced to the Lower House of the Parliament by Speaker Vyacheslav Volodin and the heads of the four factions. Artyom Potyomin with the details. - Do we know the details of the draft and how do the factions comment on the initiative? - Today, the members of parliament who developed the draft shared its details. According to them, the new law will be a response to the challenges posed by the US and the US officials in particular, their non-amicable and non-constructive actions of imposing sanctions against Russia as a whole and also its citizens and legal entities in particular. The draft legislation empowers the Russian government to conduct certain economic and political measures. As the Speaker of the State Duma said earlier, it would be wise to apply mirror-measures to the goods which the US supplies to Russia including agricultural produce, raw materials, and food produced in the USA, as well as alcohol, tobacco, and medications. Alexander Zhukov, member of State Duma: "This law will allow the government to impose a range of restrictions issued by the President of the Russian Federation regarding certain goods and citizens of the USA and other countries that imposed similar restrictions against Russia". The law also binds the government to find substitutes for American wares in the Russian market. Earlier this month, the US announced that it was expanding the anti-Russian sanctions. Several dozens of Russian businessmen, officials, and companies were added to the blacklist. The legislators couldn't let them get away with that unfriendly act. Vladimir Zhirinovsky, leader of LDPR: "We'll have a list of the US citizens banned from entering Russia. Even high-profile specialists from America won't be able to avoid the ban. The lists will be approved by the government. Our citizens won't suffer from the restrictions if they buy something for personal use like medications or goods, even from the US. The sanctions will apply to commodity supply". Ivan Melnikov, member of State Duma: "The new law will ban or restrict the import of agricultural produce, raw materials, and food produced in the US or other states that support the sanctions the US imposed against Russia. Moreover, the supply of alcohol and tobacco will also be restricted. Russia and Russian legal entities will cease or limit their cooperation with the US and the organizations in its jurisdiction working in the nuclear sector, aircraft-building, and rocket industry. The privatization of public and municipal property will be forbidden. The supply of technical equipment and software will be restricted or prohibited". Sergey Neverov, member of State Duma: "This law is an adequate response to their decisions regarding the Russian Federation. It will allow us to develop our own industry without restricting our citizens' ability to order goods from abroad". The government plans to send the draft to the regions and consult a number of experts. It will also be thoroughly studied during the meeting of the Lower House of the Parliament.